The woman was travelling with her 20 month old daughter on Tuesday when the incident occurred. 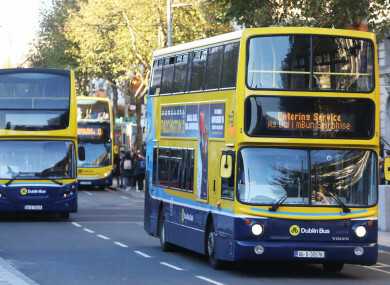 DUBLIN BUS HAS apologised to a mother who was ordered to get off a bus earlier this week because her child was crying. The woman was travelling with her 20 month old daughter on Tuesday when the driver stopped the bus and told her he couldn’t continue driving with her child making noise. Speaking to Joe Duffy on Liveline, she explained how the incident humiliated her. She said: “I had to get off the bus because I was completely mortified, he was refusing to move from the bus stop and she was still screaming so I had to get off the bus. I was mortified, I couldn’t believe this had happened and I was just so embarrassed. “I don’t know if he was having a bad day or what but he said he couldn’t concentrate on driving when the child was crying like that. When she returned home, she contacted Dublin Bus and told them what happened. She received a phone call this morning apologising for the behaviour of the driver. She added: “I’m delighted to have an apology from them but I don’t want anyone else to go through what I went through on Tuesday, it was incredibly embarrassing. A Dublin Bus spokeswoman told TheJournal.ie: “We are aware of this incident. Email “'I was completely mortified': Mother ordered off Dublin Bus because her baby was crying”. Feedback on “'I was completely mortified': Mother ordered off Dublin Bus because her baby was crying”.